Families have specific needs and wants depending on where they are in their life cycle. Regardless of your stage, our focus is to help ease the stress of raising your family. 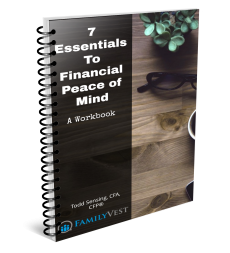 This peace of mind comes by way of comprehensive financial strategies that incorporate a highly focused understanding of each nuance of your particular needs and goals. At FamilyVest, we dedicate a great deal of attention to getting to know your family’s special and unique needs. Our primary goal in the beginning of our relationship is to identify the most important factors impacting each and every family member’s short, medium, and long term financial position. Through a consultative fact finding process, we work with you and all relevant third parties, such as your accountant, insurance advisor, or attorney, to gather the financial statements and information needed to build your financial plan. Together we will discuss our analysis, which draws upon the expert wisdom gained over more than two decades of financial experience. We work with you to provide detailed advice for your investments and guidance for your financial life, including retirement, education, tax and estate planning. We make sure all the recommendations you agreed to are implemented, coordinating with other professionals such as your attorney or insurance agent as necessary. We meet with you regularly to review your portfolio and revisit your financial plan to make sure that all the details are still on track to meet your objectives.